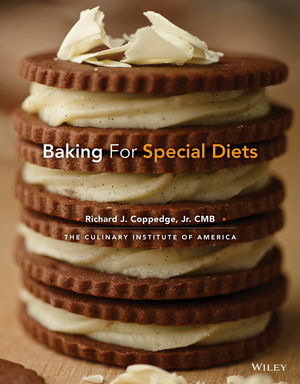 Rich J Coppedge, Jr is a professor of baking and pastry arts at The Culinary Institute of America (CIA). Chef Coppedge currently teaches Advanced Baking Principles to students pursuing their bachelor’s and associate degrees from the CIA. During his tenure at the CIA, he has taught various bread baking courses. He also helped develop and provide content for the CIA's bread baking instructional video series. Founded in 1946, The Culinary Institute of America is an independent, not-for-profit college offering bachelor's and associate degrees in culinary arts and baking and pastry arts, as well as certificate programs in Latin cuisines and wine and beverage studies. A network of more than 44,000 alumni has helped the CIA earn its reputation as the world's premier culinary college. The CIA, which also offers course for professionals and food enthusiasts, as well as consulting services for the foodservice and hospitality industry, has campuses in Hyde Park, New York; St. Helena, California; San Antonio, Texas; and Singapore. Chapter 2: What is Nutritional Baking? Currently, books on the topic are slim, single allergy-specific titles geared toward the home cook; this comprehensive, professional text covers many allergies and dietary restrictions from celiac disease to diabetes to veganism to keeping kosher. Baking for Special Diets is the ultimate reference on dietary restrictions in the bakeshop. In addition to recipes, Baking for Special Diets provides up-to-date information from the 2013 FDA Food Code on how to set up a professional kitchen to avoid cross contamination in concern to food allergies.